Add a bit of rustic flair to your home decor that is not only decorative but functional with Stonebriar's aged galvanized metal magnetic memo board with clip and wire basket. 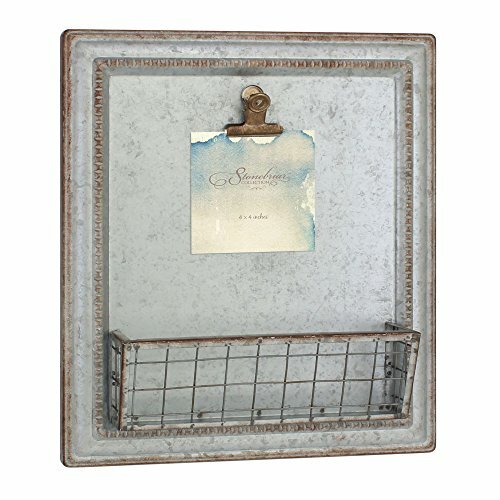 This unique memo board features an antique galvanized metal finish with rust trim giving a vintage feel. Board also comes with a metal clip and basket for organization. Magnetic board is multifunctional and can be used to organize documents in your office, keep notes and reminders in your kitchen, or hang artwork and organize art supplies in the kids room. Galvanized metal board measures 13.2 inches by 15.2 inches by 3.3 inches. It is the perfect size to hang in the entryway, kitchen, kids room, or office. Metal board comes with attached hangers. It is easily installed with screws or wall hooks (Not included). Buy a Stonebriar galvanized metal magnetic memo board and instantly add interest to your farmhouse home decor. If you have any questions about this product by Stonebriar, contact us by completing and submitting the form below. If you are looking for a specif part number, please include it with your message. Rest Relax Renew Decorative Sign - MDF Wood Block 12"x2.5"